On Saturday at least 200 people demonstrated outside the offices of the Daily Mail in London against its coverage of 'emo' - after a young My Chemical Romance fan committed suicide the paper ran a story headlined 'Why no child is safe from the sinister cult of emo’ (photo by Abbi London - more reports and reflections at Thrash Hits). There's been some incredibly patronising coverage but I think it's great. The Daily Hate needs to be called to account more often for its ludicrous 'reportage', and hopefully these mostly young MCR fans will be inoculated for life against its daily tirades against migrants, gypsies and other affronts to the enraged Middle England Right Wing. 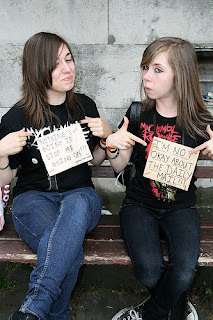 'Emos' are far from the first group of young people to be targeted by The Daily Mail. Way back in the 1920s there was "an obsession with the moral and physical deterioration of British men and women" with the Daily Mail worrying about civilisation being destroyed by women not breeding enough thanks to short hair and lesbianism. Young women enjoying themselves dancing and partying – so-called ‘Flappers’ – were particularly criticised. There were "hysterical attacks in the Daily Mail and Daily Express on the irresponsible behaviour of the 'Flappers', those selfish and irresponsible young women who were alleged to be pursuing an energetic social life and sexual emancipation. In the process, the pundits claimed, they ceased to be real women in both the psychological and even the physical sense. Referring darkly to women 'with short hair, skirts no longer than kilts, narrow hips, insignificant breasts' the Express warned: 'this change to a more neutral type can only be accomplished at the expense or the integrity of her sexual organs'". When it was proposed to allow women to vote at the same age as men, The Daily Mail waged a vigorous campaign against it, arguing that women would be more likely to vote Labour: "In a bizarre campaign the Mail carried daily headlines that screamed: 'Men Outnumbered Everywhere'; its editorials exploited Conservative fears by suggesting 'Why Socialists Want Votes for Flappers" and they urged 'Stop the Flapper Vote Folly'". "This pattern of support for the BUF in the Conservative journals culmin­ated on 5 January 1934 when the Daily Mail published its notorious head­line: 'Hurrah For The Blackshirts! ', thus inaugurating six months in which it promoted the movement. There was nothing anomalous about this initiative. Lord Rothermere had been heaping praise on fascist dictatorship throughout the 1920s…. Rothermere controlled a large slice of the press including the Daily Mail, Sunday Dispatch and Evening News, as well as several dozen provincial newspapers. He lauded the BUF as a modernising, virile, British movement, above party politics and above all as 'the Party of Youth'. 'The Blackshirt Movement', enthused the Mail, 'is the organised effort of the younger generation to break the stranglehold which senile politicians have so long maintained on our affairs.' There followed a systematic campaign of promotion in which the Sunday Dispatch turned itself into a house journal for the BUF. Not content with regular features on 'What the Blackshirts Are Doing' and biographies of the leading personnel, it endeavoured to engage its readers' involvement in the movement. In April 1934 the news­paper offered free tickets to major rallies including the one at Olympia in June 1934 and £1 weekly prizes for readers' letters on 'Why I Like the Blackshirts'. Winning entrants wrote: 'The Blackshirts place King and Country before personal motive. Up to the present, no party has done much good for the community', and 'I like the Blackshirts because they stand for Empire Unity, the re-establishment of British prestige and the reawakening in the British public of pride in the nation' The Sunday Dispatch also carried frequent reports on female fascists along the lines of 'Girl Blackshirt Attacked' and 'Beauty Joins the Blackshirts', as well as pictures of women practising ju-jitsu, fencing and physical exercise." So you see whether you like My Chemical Romance or not, you should certainly be on the side of their fans expressing their disgust at The Daily Mail. All quotes from Martin Pugh, Hurrah for the Blackshirts - fascists and fascism in Britain between the wars (London: Jonathan Cape, 2005). interesting post. i already knew that the mail used to like the BUF and i knew that its attacks on emo are not the first incidences of it attacking youth cultures, but i didn't know about the anti-flapper stuff. i suppose every generation has a few grumpy old farts who get outraged at what people younger than themselves get up to. If you had the stomach for it you could write a history of sub cultures through the eyes of the Daily Mail, but reading 80 years of this stuff would probably drive you insane.